Hurricane Matthew is one of the most powerful storms to barrel through the Caribbean in over a decade. 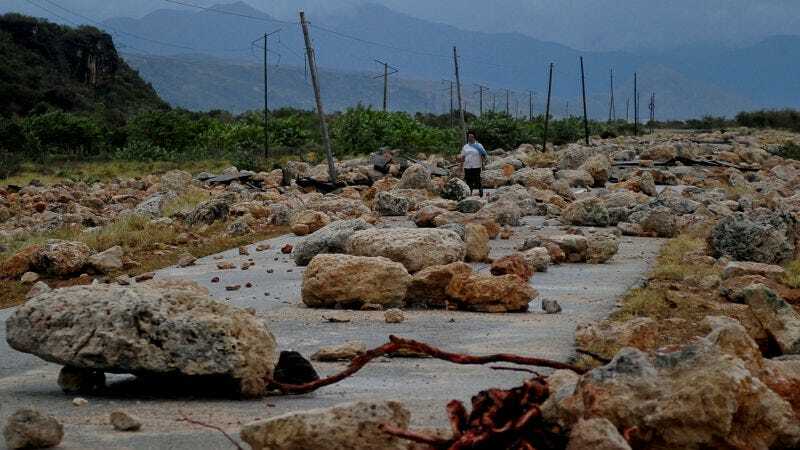 The violent windstorm has already claimed the lives of more than 108 people in Haiti and at least 4 people in the Dominican Republic. The hurricane has displaced tens of thousands more across the Caribbean including the Bahamas and Cuba. As the storm begins to pass the Caribbean and head toward the eastern coast of the US, officials are beginning to understand the scope of destruction caused by the hurricane. According to UN special representative for Haiti Mourad Wahba more than 10,000 Haitians are in shelters and hospitals that are overflowing. The United Nations also estimates that 350,000 Haitians need immediate assistance, making it the worst humanitarian crisis since the devastating earthquake six years ago. Aerial footage is filmed by ABC News shows just how extensive the devastation has been. Thousands of homes appear to be destroyed across the south-east tip of Haiti, which suffered the brunt of the hurricane’s blows. The UN has already dispatched disaster relief teams to help clear roads and provide other services to those affected by the storm. In Cuba, more than 377,000 people were evacuated from areas that were most likely to be affected by the storm. The country moved tens of thousands of people to safe areas and also took pre-emptive action to strengthen infrastructure against strong winds, rains, storm surge and floods. Hurricane Matthew is expect to hit the East Coast of the United States as soon as tomorrow, and it could bring 125 miles per hour winds. The hurricane’s winds have already reached that speed but slowed down when the storm made landfall in Cuba. Experts expect the hurricane to restrengthen as it passes over the Bahamas and depending on how closely it hugs the United States’ coast, winds could be anywhere between 50-120 mph. Earlier today, Hurricane was upgraded from a Category 3 storm to a Category 4. So, frighteningly, it seems the devastation has just begun. Update 10/7/2016: The number of people killed by Hurricane Matthew in Haiti has risen above 300, according to a BBC report. Haitian officials are saying the death toll reached more than 478 people yesterday, but this has not been independently verified by any major news agencies. Most of the fatalities in Haiti occurred in remote fishing villages and were caused by flying debris, falling trees, and rampant flooding from overflowing rivers.